Back in April, the Cambridges and Harry popped into Warner Bros. studios in Leavesden. 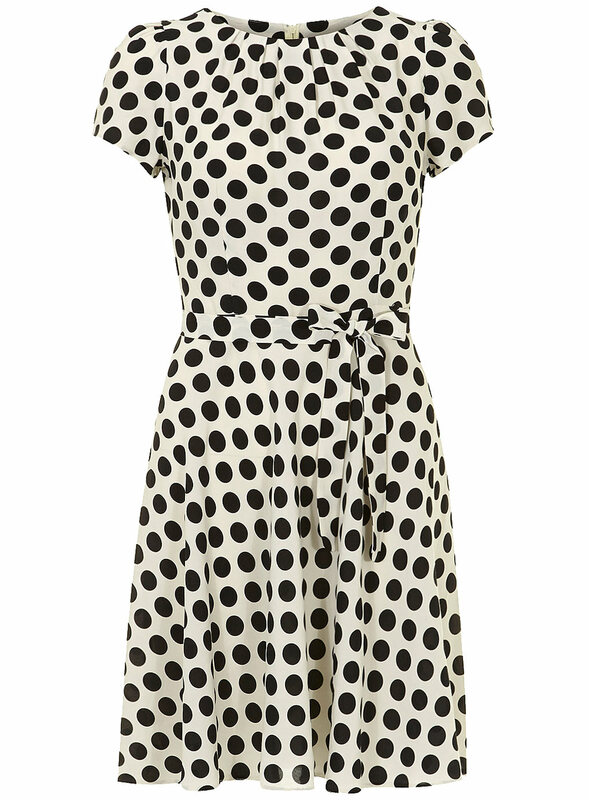 Kate wore a polka dotted dress from Topshop, and according to various outlets opting for a maternity style of dress for a change. She paired it with a black Ralph Lauren 3/4 length sleeve jacket that you may recall from various previous outings but most notably their honeymoon exit. The Duchess also opted to repeat this outfit again fairly quickly at a recent wedding. I think she looks marvelous here, comfortable and visibly at ease but still put together. Its an easy and safe combination but appropriate. While I am still not liking her choice in hem length and I personally do not think this looks like a maternity style dress. But I think this dress is looks better than than her other custom maternity dresses as of late, which I have to admit I am just not liking. The dress was identified as being the maternity "Florence" style from Topshop, seen below right. While the polka dot placement clearly matches the non-maternity "skater" style dress on the left the waist on Kate's dress looks to be a bit higher. Also note that both dresses below have the skirt about the same length as the bodice while Kate's skirt is clearly much longer than the bodice on her dress. 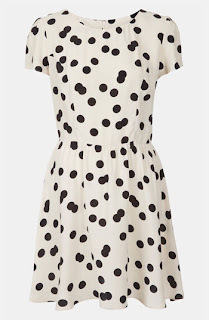 It s definitely Topshop since it matches other maternity styles on Topshop's website and I wager it is a maternity version of the dress below left (since it matches Kate's polka dot pattern) rather than the right as is the popular opinion, I just can't find the actual dress for comparison. 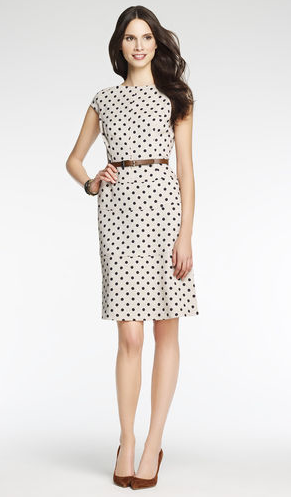 The dress features a round scoop neckline, sleeves, and slightly gathered skirt in a white and black polka dot print. Both of these dresses retail for $76 USD. Right: Topshop "Florence" dress, via Nordstrom. 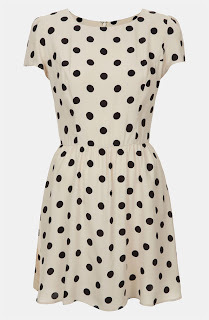 You can find lots of polka dotted dresses in a wide variety of styles but for this repliKate I stuck with dark dots on light backgrounds and dresses with round necklines and sleeves. This look-a-like from Dorothy Perkins is the non-maternity style closest to Kate's with a gathered round neckline and sleeves. Its my favorite out of all the repliKate dresses. This dress retails for $49 USD. 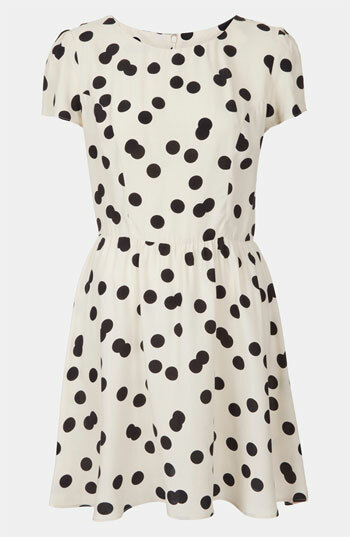 Billie and Blossom ivory black spot dress via Dorothy Perkins. 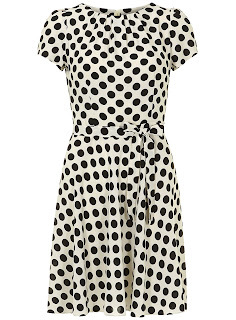 This ASOS dress, also non-maternity, in jersey fabric is a bit further removed and a bit more casual than Kate's. Though it is grey with flock textured polka dots it still features cute little sleeves, a round neckline, and a gathered skirt. This dress retails for $47.52 USD. ASOS Collection mini skater dress in grey flocked spot. This same dress is also available in a midi length from ASOS for $50.91 USD. ASOS Collection midi dress in grey flocked spot. I'll admit right away that this Anne Klein dress is a higher end version since it is even more expensive than Kate's, but it is probably the highest quality of the bunch. It has a similar rounded neckline, cap sleeves, and a tiered swing skirt. This dress, in light tan with black polka dots, retails for $129 USD. Anne Klein honeycomb dotted dress. A commenter recently alerted me to this last look-a-like of Kate's post-wedding Zara dress, as seen in this original post. It is a pleated sleeveless dress worn with the same black Ralph Lauren jacket seen above. This Calvin Klein dress is an almost exact dupe with a fully pleated bodice and skirt, and even matches the length and fabric of Kate's. This dress is currently on sale for $169 AUD (the retailer is Australian in origin), or approximately $169 USD. 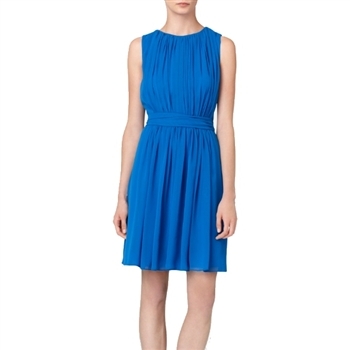 Calvin Klein blue chiffon dress via Royal Tag. Many thanks to the anon contribution, as always feel free to leave comments or email me your repliKates!